Rear of John Bright Motor Inn overlooking community croquet court. 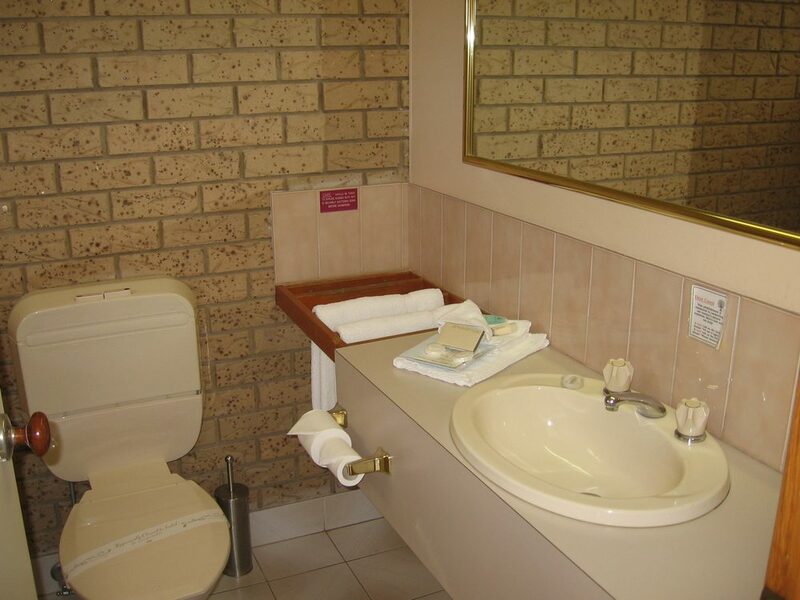 Each basic kitchenette has a bar fridge, sink, toaster, crockery and cutlery and tea and coffee-making facilities. Microwave ovens also are provided in our six premium rooms which were newly refurbished in 2014. Cooking is not allowed in any of our other rooms but we have a microwave in the guest laundry and BBQ facilities with tables and chairs in the grounds. 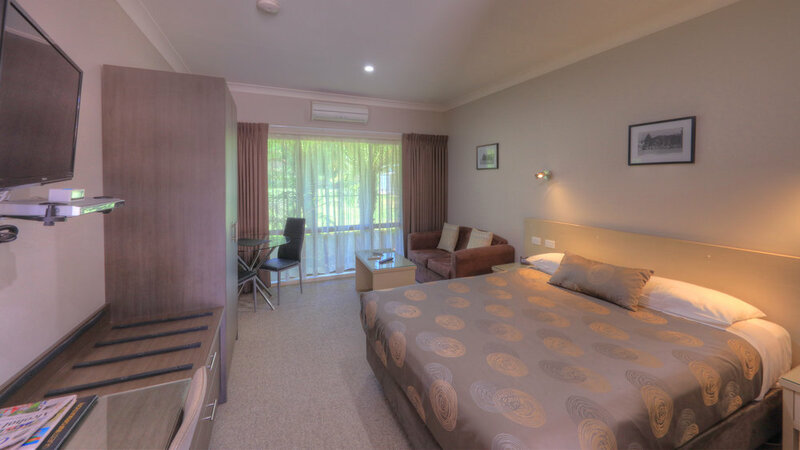 Each room has a flat screen TV, DVD player, free in-house movies, hairdryer, iron and ironing board, radio, alarm clock and free wireless Internet. We provide free detergent and the use of the communal washing machine facilities. Drying facilities however are charged at $2 per half hour. In-room continental breakfast available for $9 per person. Off-street parking available, 1 vehicle per unit. 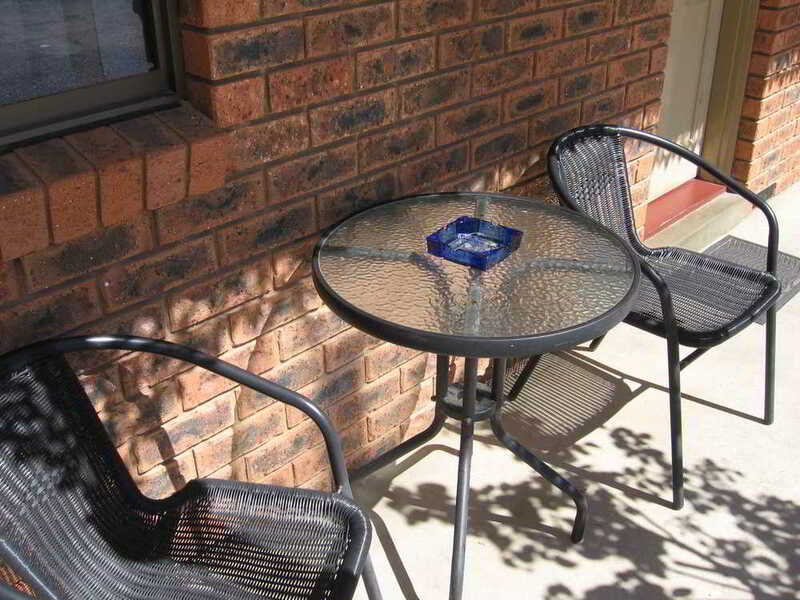 SPECIAL FEATURES: Fully refurbished in 2014, with a front verandah or courtyard, walk-in shower. This one room, reverse-cycle, air-conditioned ensuited unit was fully refurbished in late 2014. It has a queen bed and Couch as well as a breakfast bench with two dining chairs and an espressotoria system coffee machine. Clock radio with 2 built -in USB charging outlets. The ensuite has a walk-in shower. Each ground floor room has a courtyard while the first floor rooms have a balcony. At the top of this page there is an extensive list of other facilities common to all rooms. RATES: $165pn (low season) to $195pn (peak). This rate is based on a maximum of 2 guests. These rooms are children-free and bicycle-free. For families, see the menu heading 3-6 guests. A 2-5 night minimum applies in peak periods. This one room, reverse-cycle, air-conditioned ensuited unit was fully refurbished in late 2014. It has a queen bed and couch. Clock radio with 2 built-in USB charging points. There is a breakfast bench with two dining chairs and an espressotoria system coffee machine. The ensuite has a walk-in shower. At the top of this page there is an extensive list of other facilities common to all rooms. RATES: $160pn (low season) to $190pn (peak). The rate is based on a maximum of 2 guests. These rooms are children-free and bicycle-free. For families, see the menu heading 3-6 guests. 2-5 nights minimum in peak periods. 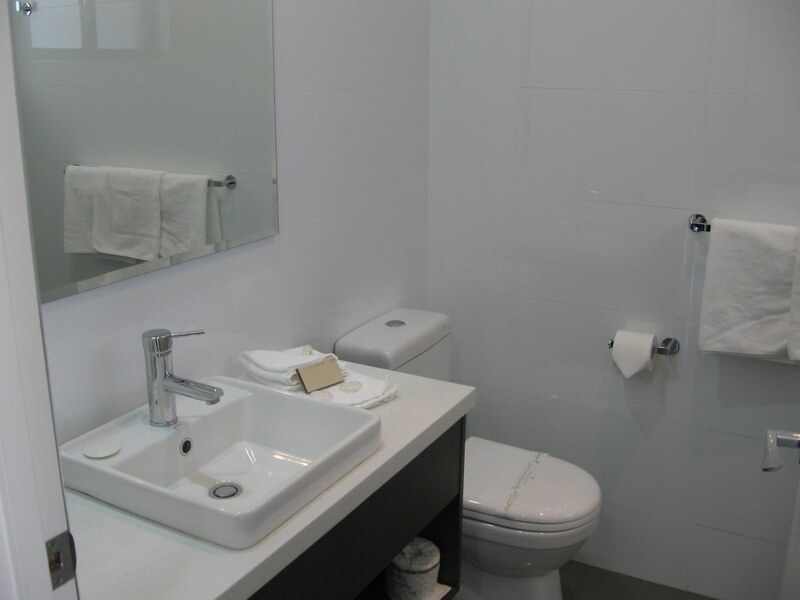 This one room reverse-cycle, air-conditioned balcony style ensuited unit has a queen bed, sofa and dining table. 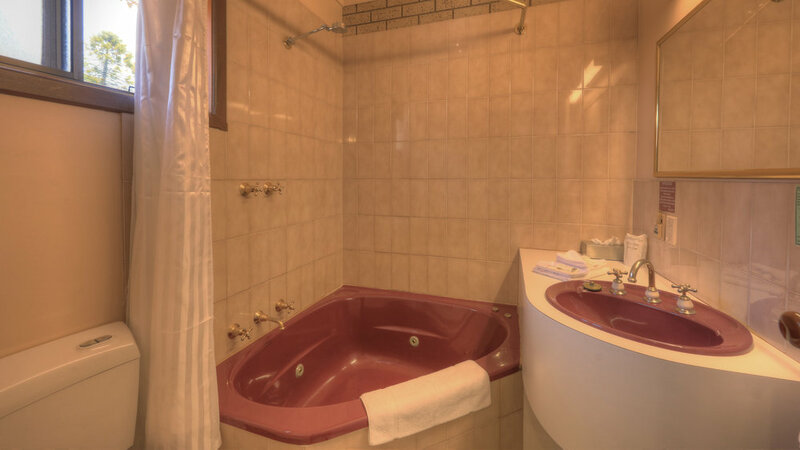 The ensuite has a spa bath/jacuzzi . At the top of this page there is an extensive list of other facilities common to all rooms. RATES: $155pn (low season) to $185pn peak. The rate is based on 2 guests with 2 adults or an adult and a child. A maximum of 2 guests applies. 2-5 nights minimum in peak periods. This one room, reverse-cycle air-conditioned executive style ensuited unit has a sofa and dining table. At the top of this page there is an extensive list of other facilities common to all rooms. RATES: $145pn (low season) to $175pn peak for up to 2 guests that is, 1- 2 adults or an adult and a child. The room cannot exceed 2 guests in total. 2-4 night minimum for peak periods. SPECIAL FEATURES: Budget price, rate also for one adult, bath, ground floor. Can be combined with other rooms to form a 2 bedroom family unit. This one room, reverse-cycle, air-conditioned ensuited unit has a sofa, dining table and queen bed. The unit is on the ground floor. At the top of this page there is an extensive list of other facilities common to all rooms. RATES: $135pn two guests (low season) to $165pn peak for up to 2 guests. Maximum of 2 adults or an adult and a child. . This room cannot exceed 2 guests in total. 2-4 night minimum for peak periods.